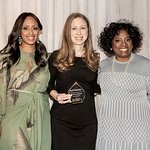 On Monday, June 23rd, Clinton Foundation Vice Chair Chelsea Clinton will host From STEM to Success: A No Ceilings Conversation – the fourth in a series of live and virtual dialogues designed to hear directly from girls, women, men and boys about how to support and expand opportunities for women and girls globally. Moderated by Kari Byron, Co-Host of Discovery Channel’s Mythbusters, From STEM to Success: A No Ceilings Conversation will bring together middle and high school aged girls as well as women in STEM (Science Technology Engineering and Mathematics) careers to talk about how a STEM-based education can lead to a successful career. Students from Denver Public Schools, Urban Advantage Science Camp and the Denver Museum of Nature and Science Teen Science Scholars among other groups will join women in STEM-related professions from the Denver area who are using their STEM background in diverse careers from city planning and building construction to medical labs and technology development. The conversation, powered by Microsoft, will be streamed online to allow people around the world to join remotely and ask questions via digital platforms. The event will take place at the planetarium in the Denver Museum of Nature and Science in Denver, Colorado. This conversation series is part of the Clinton Foundation’s initiative, No Ceilings: The Full Participation Project, which seeks to advance the full participation of women and girls around the world. These conversations will be used to shape and inform the work of the initiative, which is focused on making an evidence based case for full participation. Prior No Ceilings conversations have addressed the progress and challenges on issues related to girls, education, and the workforce. The event takes place on Monday, June 23rd, at the Denver Museum of Nature and Science, Planetarium. A live webcast of the event will be available here.